SUMITUBE® B2 (3X) Heat Shrinkable Tubing is recommended for general purpose applications for protection of components in light wire harness assemblies. It can be used where oversized sub-components prevent the use of a standard heat shrinkable tubing. It can also provide the user with better economies, as one size tubing can often replace 2 standard 2:1 expanded tubing sizes, thereby reducing inventories. SUMITUBE® B2 (3X) is a very flexible, flame-retarded, heat shrinkable polyolefin tubing which meets all of the material and functional requirements of Military Specification AMS-DTL-23053/5, Class 1 and 3, with exception to dimensions and longitudinal change. B2(3X) is overexpanded to have a recovery ratio of 3 to 1 as opposed to the normal 2 to 1. B2(3X) is recognized by UL under Subject 224 as 125ºC 600V with a VW-1 rating. Recovery temperature is 90°C and operating temperature range is -55°C to +135°C and up to 200°C for short time durations. Standard Package: Spooled (SP) or 4 foot lengths (4). MIL-I-23053/5 Class 1 and 3. 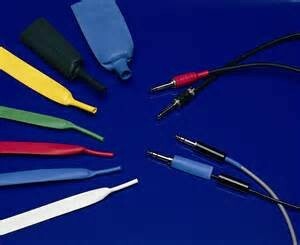 Polyolefin Heat Shrink Tubing.